Hobby Lobby ‘Encouraged’ by Oral Arguments!! christianpost.com – WASHINGTON – Supporters of two companies suing the Health and Human Services Department over its “preventive services” mandate are “encouraged” by the responses they received from members of the U.S. Supreme Court during oral arguments. Hobby Lobby Inc. and Conestoga Woods had their case against HHS argued on a wintry Tuesday morning before the Court. The two companies are arguing that the HHS mandate violates their religious liberty by compelling the family owned companies to provide certain contraceptives and abortion-inducing drugs that they hold moral objections to. Barbara Green, a member of the family that heads Hobby Lobby, said in a statement read before those gathered outside the Supreme Court building that she was “encouraged” by the arguments. “We were encouraged by today’s argument. We are thankful that the Supreme Court took our case and we prayerfully await the Justices’ decision,” said Green. The Rev. Rob Schenck, president and lead missionary of Faith and Action in the Nation’s Capital, was with those gathered inside the chambers. 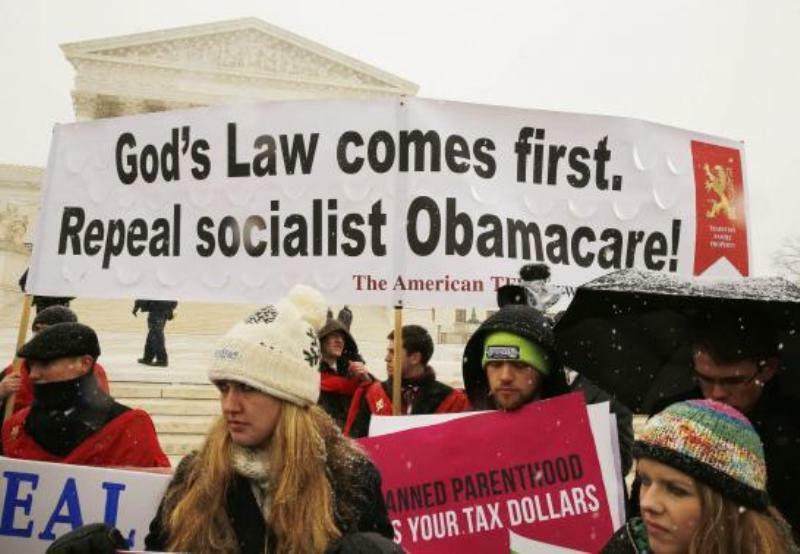 Referring to the healthcare law mandate as an “egregious violation of our God-given rights,” Schenck explained to those gathered that he felt encouraged by the proceedings. “As I listened to the exchange with the Justices on the bench, I took very careful note. Its very clear that this decision will rest with Justice Kennedy once again,” said Schenck. Based in Oklahoma, Hobby Lobby is a crafts retail chain that objected to being compelled by the HHS mandate to provide four specific preventive services believed to be abortion-inducing. Run by an Evangelical family, Hobby Lobby sued to be exempted from the mandate and won at the Tenth Circuit Court of Appeals level. Conestoga Wood Specialties Corp. of Pennsylvania similarly filed suit against HHS over the mandate, but lost at the Third Circuit Court of Appeals level. In July 2013, a 2-1 ruling by the United States Court of Appeals for the Third Circuit went against the company, which claimed that it would be “sinful and immoral” for the Mennonite owners to pay for or support certain forms of contraception as required by compliance with the Affordable Care Act ,aka Obamacare that is UNCONSTITUTIONAL Health-Care Being FORCED on Everyone in the UNITED STATES OF AMERICA!! Upon taking the appeal, the Supreme Court paired the two cases together and 90 minutes of oral arguments were heard Tuesday morning. Hobby Lobby and Conestoga’s lawsuits against the HHS are two among scores of suits brought by various entities over the controversial mandate. According to the anti-mandate Becket Fund for Religious Liberty, as of March, 94 cases have been filed with approximately 300 plaintiffs represented. ( John 14:6 KJV ) “Jesus saith unto him, I AM the Way, the Truth, and the Life: no man ( or anyone ) cometh unto the Father, but by ME.”!! United We STAND with Israel-Yisrael and our Judeo-Christian Nation United States of America, Divided We FALL!! « Al-qaeda ( ISIS ) Syrian Rebels To Receive Air Defense Aid From Obama Administration! !